Many of us have a macabre habit of believing that famous people die in groups of three. Last week, when I saw that Thomson Reuters had acquired PLC, and then Lexis announced they had acquired Knowledge Mosaic, I waited for the third announce, which I assumed would come from Bloomberg. I was right about the acquisition, but not about the company behind it. Instead it was Thomson Reuters rounding out the tri-fecta with their acquisition of the Continuing Professional Education (CPE/CLE) product of LearnLive Technologies. Although Thomson Reuters already has a similar program with West LegalEdcenter, it seems that LearnLive has been taking some of West LegalEdcenter’s marketshare away, thus Thomson Reuters reached for its checkbook and decided that if you can’t beat ’em… buy ’em. As with both PLC and Knowledge Mosaic, LearnLive has quite a reputation for customer service and personal attention given to its customers. Just as with PLC and Knowledge Mosaic, there is a mild enthusiasm on behalf of the company being acquired that they will benefit from all the additional resources of the Mega-Company, while customers are once again left groaning that they will see pricing increases and service decreases. Time will tell to see if the acquired company’s optimism prevails over the pessimistic customers. I had a conversation with a librarian last week about all the acquisitions, and during the conversation, he openly wondered if Thomson Reuters’ moves in purchasing some duplicative products could be to position the Thomson Reuters Legal (aka Westlaw) product to be spun off from the big TR franchise. That is an interesting thought. Here’s a statement I received from Thomson Reuters on the LearnLive acquisition. 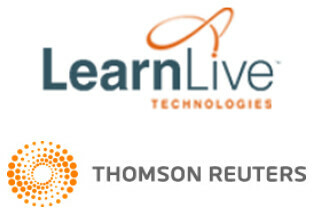 Thomson Reuters has acquired LearnLive Technologies, which provides a hosted solution for the creation, delivery, tracking and management of eLearning programs for accounting and law firms. LearnLive is now part of the Tax & Accounting business of Thomson Reuters, which delivers a complete range of continuing education (CPE) to tax and accounting professionals under itsCheckpoint Learning brand. “This acquisition is beneficial for customers of both businesses, because it combines LearnLive’s best of breed technology and solutions focused on the needs of large accounting and law firms with Checkpoint Learning’s innovative platform,” said Steve Mendelsohn, SVP and general manager for the Tax & Accounting business of Thomson Reuters.